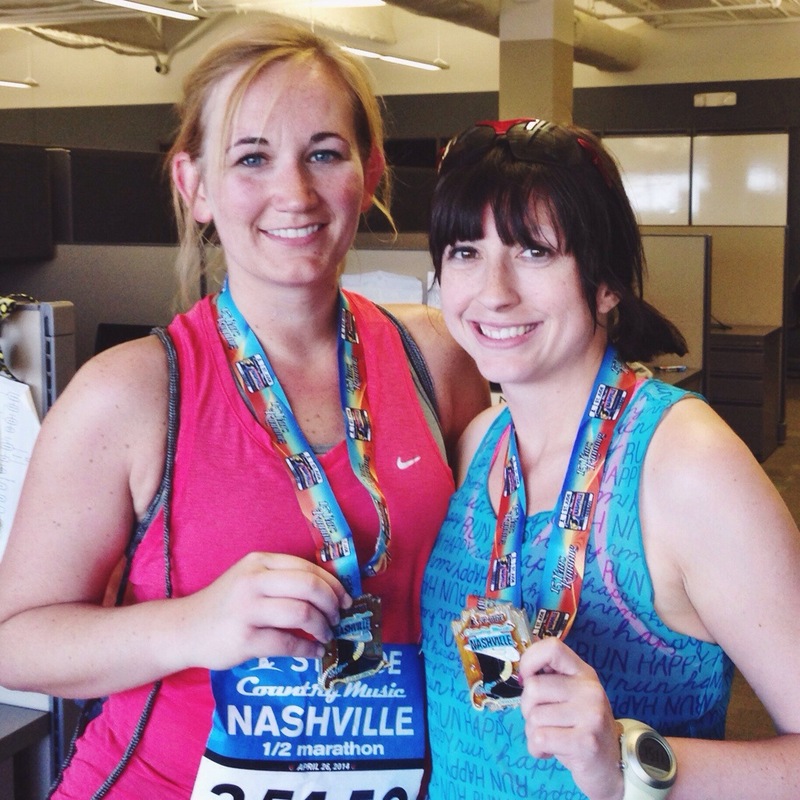 My second half marathon is in the books! 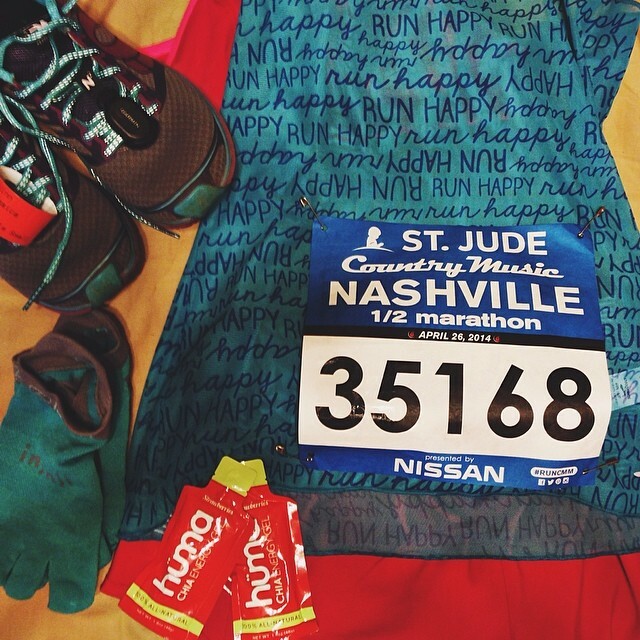 A Goal: Run 2:30:59 or better. B Goal: Run 2:38:59 or better. C Goal: Run 2:45:59 or better. D Goal: Just finish with a PR. Any PR. If you recall, I managed to run the 13.1 distance in my 14 mile training run in 2:42:47, so I knew at least my C Goal was achievable. (My half PR from the Disney half was 3:07:43. Totally beatable.) My times based on my performance in my 15k, 5k, and 5 mile races that I’ve ran over the past few months predicted 2:33:41, 2:25:27, and 2:23:54, respectively. I’d been training for an 11:30 min/mi pace, which would put me at 2:30:39 with even splits. I’d been getting faster. The speed work had been paying off. My goal pace was starting to feel “easy”. So everything was there to say that I could achieve my A goal. I just had to put the pieces together. I also wanted to keep the first few miles easy because it was impossible to warm up before starting. 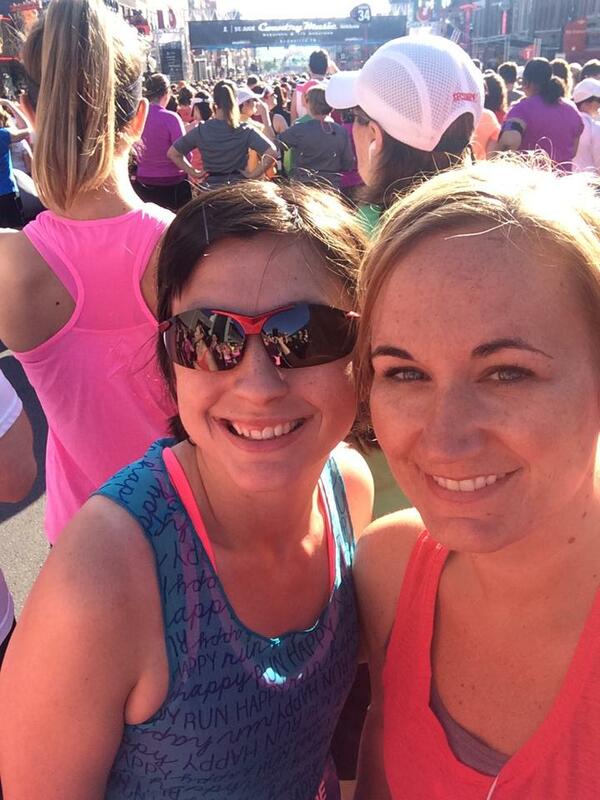 We had to be in our corrals at 7am, but Amanda and I were waaaay back in corral 35 (out of 40). 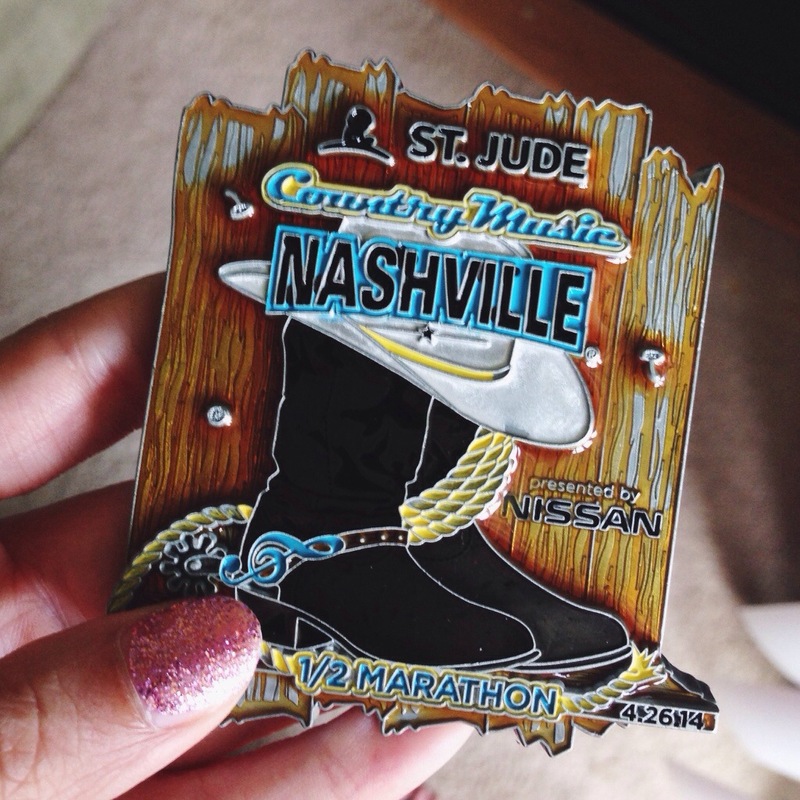 There’s 1-2 minutes between corrals, so you do the math. Any warmup I would have done wouldn’t have done me any good after an hour of waiting. So I was starting back with the 3 hour finisher folks (plus I wanted to hang out with Amanda since we had to chill for so long) hoping that I wouldn’t go out too fast. After an hour of waiting, we were happy to be almost to the start line! Finally, we were at the start, just after 8am. Even though I was back with a slower crowd (the 2:30 pace group was up in corral 30), they still started off faster than I wanted to, around a 10 min/mi pace. I forced myself to slow after the first half mile or so and completed the first mile just under goal pace in 11:20. 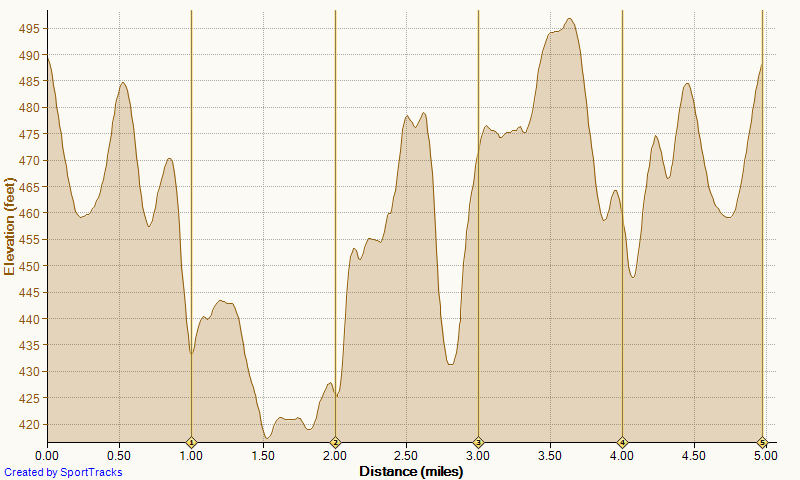 Mile two ended on that hill on Demonbreun that I’ve run twice before, so I was ready for it. I slowed a little on it, but Jonathan and his friend Andrew (whose wife was also running the half) were waiting at the top to cheer me on. At the 5k point, my watch said it had been a little over 35 minutes: right on target. The next three miles I ran a little fast: 10:59, 10:48. and 10:36. Miles four and five were down Belmont Blvd and a bunch of people were out cheering us on. 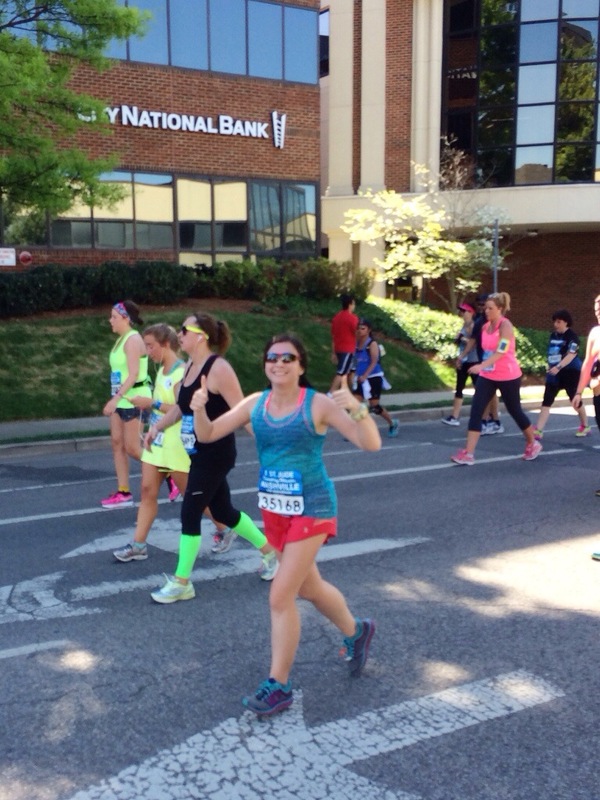 I gave so many people high fives as I ran by! I think the crowds were probably what excited me and my adrenaline rush made me go faster than planned. I ate my first gel just after mile four, and didn’t stop while I was eating it until I got to the water station to wash it down. I also appreciated the people with water hoses spraying everyone because it was starting to warm up! I hit the 10k mark a little ahead of schedule. Mile seven was down 12 South and the entire mile was a steady incline. And it was in the sun with no shade. So back to goal pace, finishing the mile in 11:26. The next three miles had a lot of downhills so I sped up again: mile eight in 11:09, mile nine in 10:55, and mile ten in 10:50. I passed Jonathan and Andrew again right before mile nine and then ate my second gel. Passing by Jonathan and Andrew again! Somewhere just after I started the final 5k (just after mile ten), I realized how exhausted I was. I also knew what goes down will probably go back up. I kept going but had slowed back to goal pace, completing mile eleven in 11:30 exactly. My only official photo? This was around mile 10-11. There had been a water station just at the start of the twelfth mile, which I had stopped at for a cup. I kind of wished I had gotten two, as it had heated up above 70 degrees at this point. I knew the heat was getting to me and I was feeling a little dehydrated. I ended up walking a little extra past Bicentennial Park. Then I came upon another, unexpected, water station. Yay! I grabbed another cup and downed it before finishing off the mile. It was my slowest, obviously, coming in at 12:18. I knew at this point there was only a mile left, but all I could see was the long incline ahead of me. So I walked a little briefly at the start of the thirteenth mile as well. With a half mile to go, I took off. I was feeling sluggish, but I knew there wasn’t much left. I passed all the crowds lining path to the finish line. 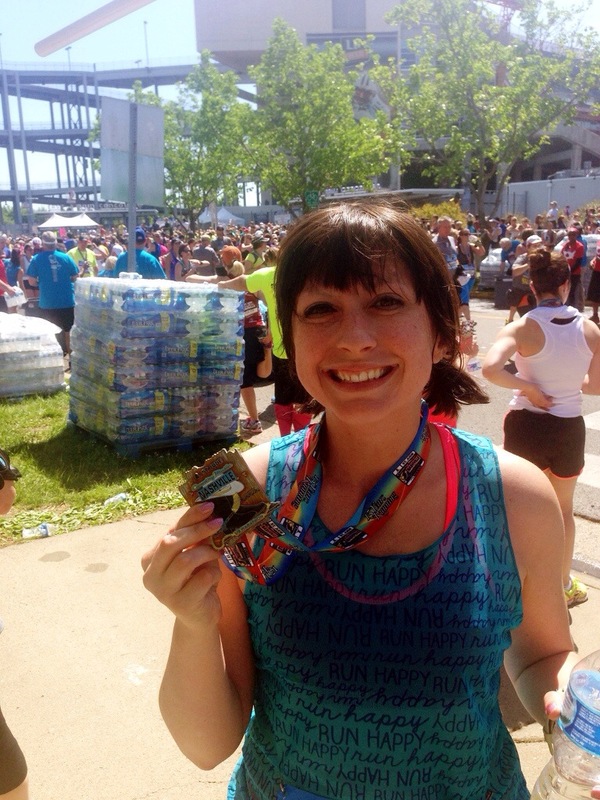 Once the finish was in sight, my body found all sorts of untapped energy and I SURGED to finish. I don’t think I’ve ever ran that fast in my life. 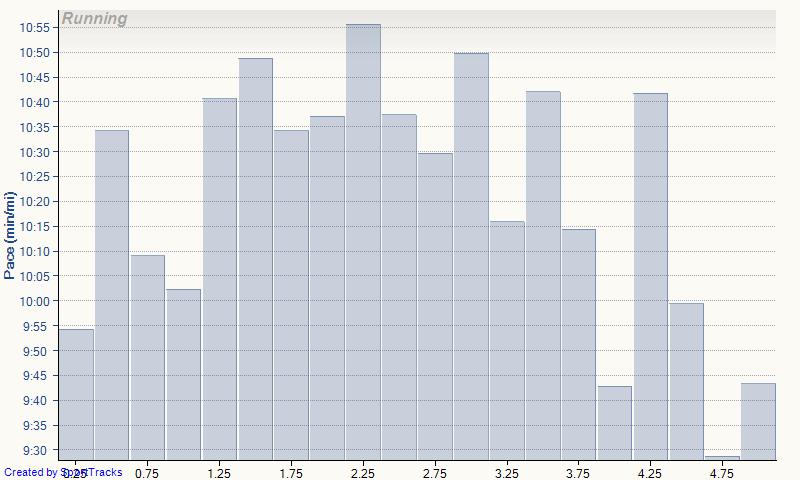 My data says I hit a 6:05 min/mi pace at one point for 10 seconds! In fact, my whole last half mile was the fastest I did the entire race, averaging 9:38 min/mi. While it was fun to finish that strong, it made me think that I probably could have finished the race without the extra walking and maybe finished faster. This was taken within 5-10 minutes after I finished. So happy to be done! Not that I can complain. 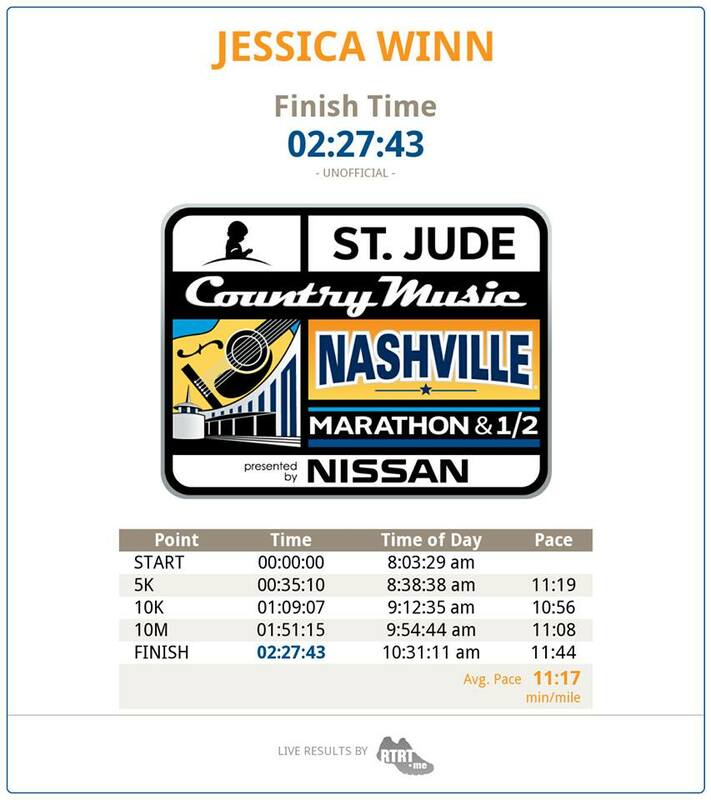 My official time was 2:27:43. Yes, I achieved my A Goal by over three minutes! And it was exactly a 40 minute PR. Down to the second. I shaved 40 minutes off my half marathon time in only three months (okay, 6 of those minutes don’t really count because I was taking photos with Disney characters, but still)! That’s what actual good training will do. After I crossed the finish line, I got my medal, some water, and some chocolate milk. Jonathan and Andrew found me and we waited for Amanda to finish. 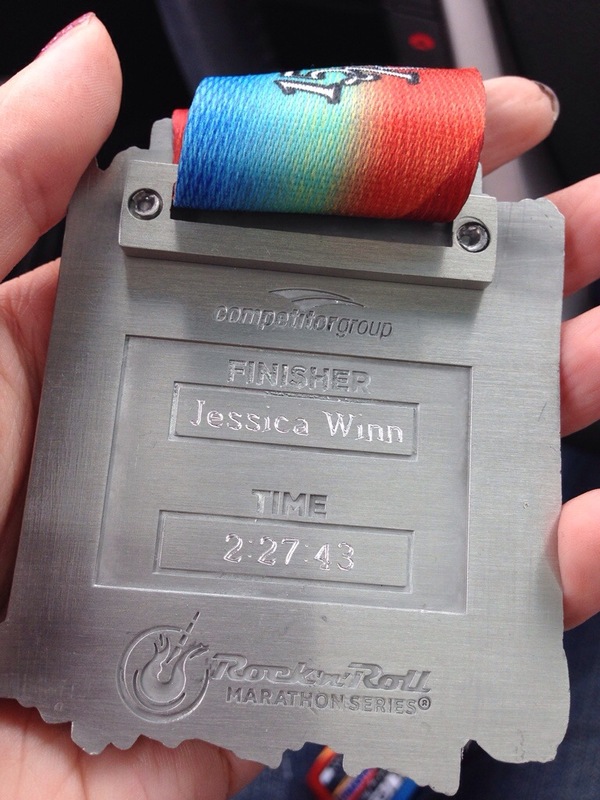 She crossed the finish line in a little over three hours and officially became a half marathoner! Amanda and I proudly displaying our medals! Big races like this can be kind of hit or miss. I didn’t have any issues with anything, other than the $5 charge for runner tracking, which seems a bit nickel-and-dime to me for an already pricey race. Otherwise, it was a well-organized race. We quickly got through the expo without any hiccups. The corrals were clearly marked and went out fairly quickly. Water stations seemed well-stocked and were plentiful. The volunteers were all fantastic. And I love the medals! Fleet Feet in Green Hills did free engraving the day after the race, so I took mine in to have it engraved. Nice bonus! I wore my footpod and my cadence hovered right at 90 (180 for both feet) the entire race. Perfection! You can see that the only times it went below 90 are water stations and my two brief walk breaks towards the end. Look at it shoot up for my finish! My outfit was perfect. I bought a warm sweatshirt from Goodwill the day before which I stripped off right before the start of the race and threw in a donation pile. My Brooks mesh shirt kept me super cool in the sun and dried fast, even after I ran through sprinklers and water hoses. I chose to run in my Pearl Izumi N2s, which are the shoes I do all my long runs in (and also the ones I ran in at Disney). I got one blister on my left foot, but I don’t think any of my other shoes would have faired better. I’ve determined I need to size up a half size in all my running shoes this year. My watch read that I ran 13.15 miles, so I did well on my tangents and weaving! Even though I still felt that I did quite a bit of weaving since there were a lot of walkers on the course. By mile 10 or 11, it was rare to see anyone running. Overall, I am pretty happy with my performance. Except for that one slow mile. I wish I would have sucked it up a little more and kept going. In more optimal weather, I probably would have. But I can’t be disappointed with my time at all! So will I do another half? Probably. But not this year. I’m eyeing a few different ones in 2015, including the Tom King Half early next March. We will see how my 5k/10k training goes this summer, and then I will probably start making decisions on when I want to start training for distance again. The race is Saturday! The race is Saturday. I’m freaking out a little. Huge motivation issues. I finally forced myself to just go do three miles by promising an entire frozen pizza upon my return. I actually promised myself Little Caesars, but did a bait and switch at the end to save money. Since I didn’t want to run, I wanted it to be over as soon as I started. This means I ran faster than I should have. During the first mile, I estimated that I was probably running close to a 10 min/mi. When my watch beeped to let me know I had gone a mile, it said my average pace was over an 11 min/mi. I about cried. I was only going half marathon pace? How was I ever going to maintain that pace for 13 miles when it felt so fast after a mile? It made me feel a little better when I got home and saw that my GPS data was messed up for the first part of the mile, so I actually WAS going a little faster than that (although probably still not as fast as I thought I was going, but I was running into the wind). I ended up doing a little over 3 miles in 33 minutes (with 3 walk breaks), or just slightly lower than an 11 min/mi average. Yes, a little fast. Since I needed to go buy gels for the half, I decided to go out to run with the East Nasty group. They meet up fairly close to Nashville Running Company, so I could stop by there, pick up gels, and then walk over to meet the group. This was the first time I’ve ever really run with the Wednesday group (minus that time last year when I attempted the Tomato 5k route with the potato to tomato group…that didn’t go so well). I lined up towards the back of the group and soon struck up a conversation with a couple other ladies. We all were running with the 10+ min/mi group. The run went pretty well. 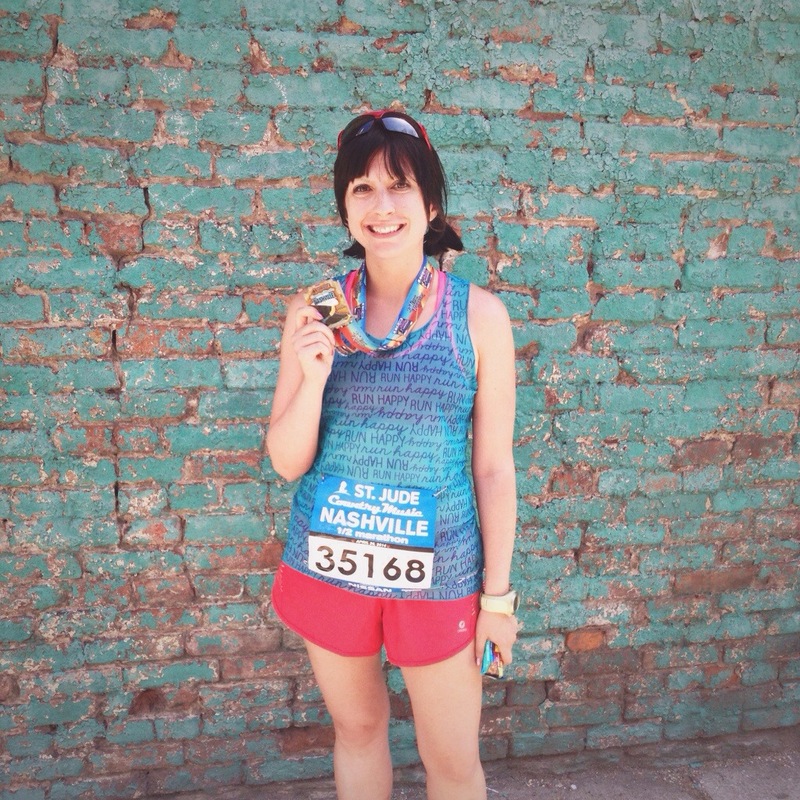 The route was an out and back from East Nashville, through downtown, and up to the Musica statue (yes, I had to run that hill from the Fangtastic 5k…I get to run it again in the half marathon), for a total of around 10km. I will definitely say being in a group helped for this run. If I hadn’t been running with other people, I probably would have been slower or walked some (the only stopping I did was at stop lights). Instead, I completed what would have been my fastest 10k ever if I had run 0.02 more miles. 6.18 miles in 1:05, or about a 10:30 min/mi average! And on a route with some serious hills (the Music Row hill, the pedestrian bridge, and that half mile long hill up Boscobel in East Nashville). Confidence raised for the half marathon! I met up with one of the girls I had met the night before for a run on the greenway. She’s a little speedier than me, so we ended up doing five miles at an average of 10:40 min/mi despite my legs being slightly heavy from the two speedy runs on the days before. We took a few walk breaks, mostly up hills, and still managed that average, if that gives you an idea of how speedy we were being. I was very thankful for my rest day on Friday and resolved to keep the rest of my runs easy until the half. After all my fast running during the week, I ended up taking two rest days and then went out for six miles on Sunday. It went well. I was at Moss Wright Park, which has a two mile loop around the park. I did 3:1 intervals on the first loop, ran nonstop at (or below) goal pace for the next loop, and then did 3:1 intervals again for the last loop. It was hot, so it was a little tiring, but felt good! I ended up averaging 11:36 min/mi for the six miles, or right at goal pace. Sorry this is light on photos. I tried waiting around to see if they were going to post any, but I haven’t found any yet. I didn’t really know what to expect time-wise out of this race. My easy pace 5 mile runs usually come in a shade over an hour, between 1:01-1:03. The McMillan calculator said I could do 52:06 based on my last 5k time or 55:02 based on my 15k time. The best 5 miles I’ve ever done was the end of the Hot Chocolate 15k, where I ran 5 miles in 53:26. I decided to aim for 55 minutes, starting with 11 minute mile splits and seeing how I felt from there. I arrived at the race with plenty of time to spare. 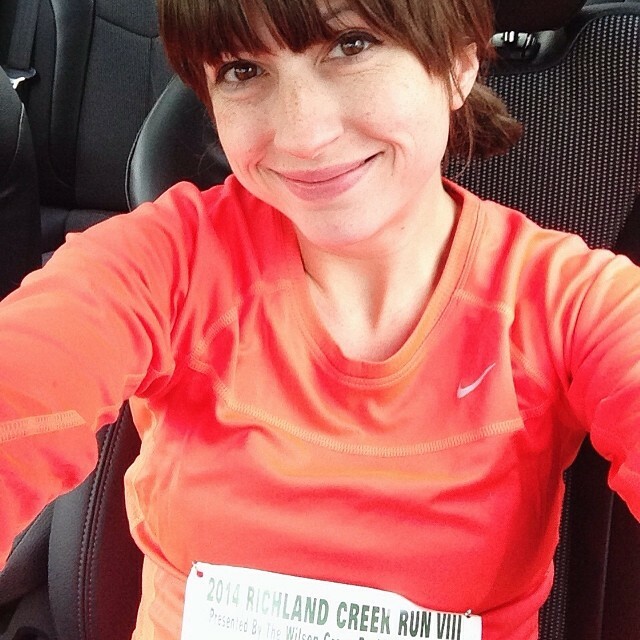 I got my race bib, pinned it to my shirt, then sat in my car for 10 minutes or so because it was COLD outside. It was in the lower 40s, and I had decided to wear a skirt with a long-sleeved top. Finally, I got out and started my warmup about 20 minutes before the race was scheduled to start. My warmup was not terrific. My legs had been sore and stiff all week long (I had cut my previous two runs short), and that day was no exception. I trotted along slowly to get the blood flowing to them. My hands, on the other hand, felt like ice. After half a mile, I decided that I wanted to make a final bathroom stop before heading to the start line. The best thing about this race was packet pickup was inside the Cohn building, so there were actual restrooms instead of portapotties. Yay! The line wasn’t bad, so I was in and out pretty quick. I spent my remaining time trying to stretch out some of my stiff areas (my calves). Soon we were off. I knew I started too fast, but I couldn’t seem to make myself slow down since we started on a downhill. I ended up completing the first mile in 10:09. There was oddly a water stop around half a mile in, which I didn’t stop at. But by the end of the first mile, I kind of wished I had. The second mile put us on the Richland Creek greenway, and I consciously made myself slow down. However, I still couldn’t seem to get down to my planned 11 min/mi splits. Mile two was done in 10:41. At this point, I was really wanting some water. Mile three was perhaps the most scenic. There were a couple bridges we crossed, where I kind of wanted to stop and take photos, but I didn’t. It was also very hilly. Luckily, I came across a water station just after the halfway point and happily slurped down some water. Then it was up a hill to the start of mile four. The thing I remember most about mile four was one of the volunteers who was cheering us on clearly said there were no more uphills. This was about 3.5 miles in. And he was a liar. Because practically all of mile five was uphill. I mean, really, what evil person puts a finish line at the top of a hill? I guess I should have realized this seeing as the start and finish were the same spot and we started out going downhill, but it didn’t click until I rounded the corner for the final half mile. 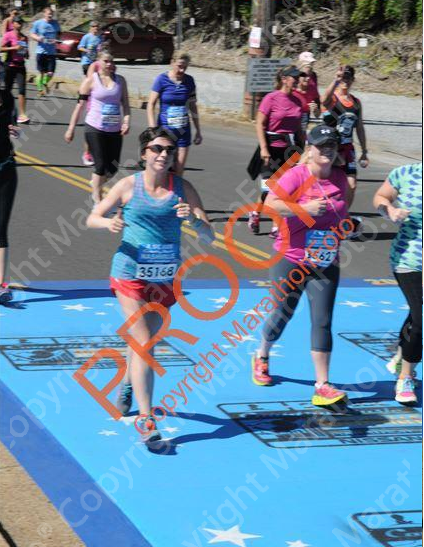 I fought with myself for that entire half mile, wanting to walk so bad but not letting myself since I could literally see the finish line. There were two girls running just ahead of me and with about a tenth of a mile to go, I found some untapped energy and surged ahead of them up the hill and across the finish. Then I thought I might throw up, so I walked around for a while before grabbing my banana and water. Is that how you know that you ran to your full potential? If you want to throw up at the end? Because my official time was 51:32, or 30 seconds faster than what my 5k time predicted, at an average of 10:19 min/mi pace. I even managed to run a sub-10 minute last mile despite all the torturous uphills. Amusingly, my watch measured the course at 4.98 miles. It’s a certified course, so I don’t know exactly how I came up short. Usually watches read longer on certified courses because it’s hard to run every tangent. 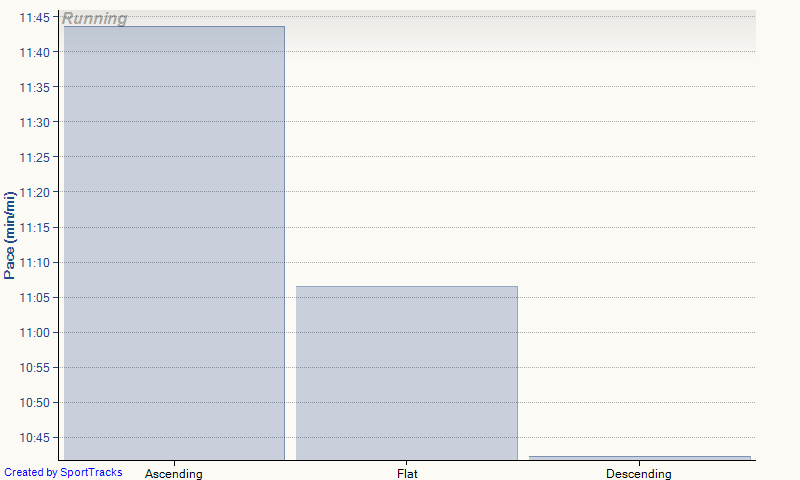 So I guess I did excellent on my tangents. 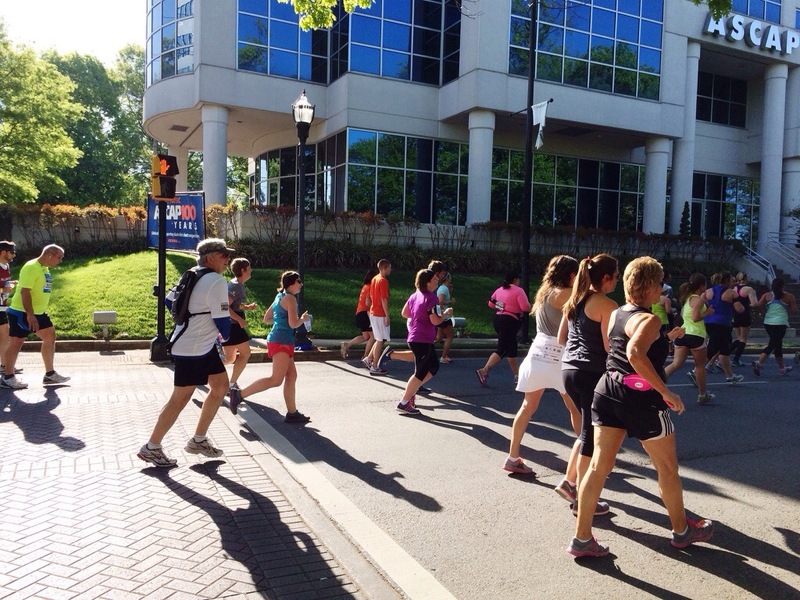 My biggest complaint about the race (other than that last hill) was the water stations. There were three: one half a mile in, one around 2.6 miles in, and one 4.25 miles in. The odd thing is the first one. First, I didn’t see anyone stop at it at the start because it’s only half a mile in. Second, you pass it again on your way back, which is only a quarter mile after the 4.25 mile stop, so, again, I didn’t see anyone stop at it. I would move it to around mile 1-1.5. I also think the 4.25 mile station could be pushed back to 3.5-4 miles. That would even them all out a bit more. It wasn’t a huge deal today, but if it had been hotter, I would have been dying by 2.5 miles with no water. One plus about this race is they separate the runners and the walkers. The runners start at 8am and the walkers start at 8:05 (and I don’t believe they were chip-timed), essentially having two corrals at the start. So I hardly saw anyone walking the entire five miles (and those that were mostly stayed to the right), which meant I didn’t have to do a lot of weaving to get around people (which probably helped my tangents). I wish more small races would make that distinction. Limiting the range from 420 ft to 495 ft makes this look way more dramatic. Believe me when I say that 9:45 at the end WAS a finishing sprint.